There are many ways to access your DOE files offsite. The order is roughly easiest to hardest. 1. Using WinSCP http://winscp.net/eng/download.php. Download, install and run. Configure the screen as shown below. 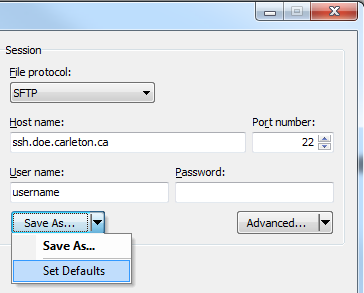 To make it easier to use in the future just click "Save As.." -> "Set Defaults"
Clicking "Login" will connect to your DOE home directory. 2. 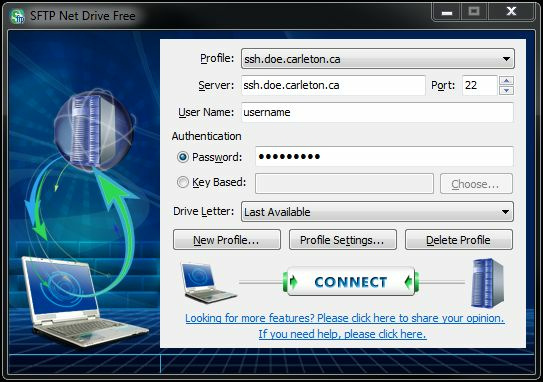 If you perfer mapping it to a Windows drive, like your W: drive when at DOE. Here are two different methods. After installing it and connecting you will now need to map the drive. Follow the instruction here How to access your Unix home directory. 4. There is no Dropbox like functionality here at DOE, but you can sync all or some of your files using BitSync https://www.resilio.com/individuals/. If this is something your are interested in please contact DOE support.